A Reggie Minnie is referred to in Norman Mailer's novel Harlot's Ghost first published in Gt Britain 1991 by MICHAEL JOSEPH, London. The Penguin Group, 1991:p178 This is a novel about the American Central Intellegence Agency (CIA). Mr and Mrs Frank Minney appear as characters in the children's novel, 'The Winged Colt of Casa Mia' by Betsy Byars. The book was published in 1973 by The Bodley Head (UK). Ms Byars wrote that the inspiration for Mrs Minney came from her daughter's second grade teacher, Miss Minney. This was when she was living at Morgantown, West Virginia, and the school was Suncrest Elementary, sometime in the early 1960s. The book was turned into a tv three part special in the US. The role of Mrs Minney was played by Jane Withers, a former child star. In Enid Blyton's short fairy story, 'The Rub-Away Flannel', Meanie the goblin rubbed away Mrs Minny's front door knocker. Minie ball and Minie rifle get their names from Capt C Minie of France. Minnie or Minny is a Scottish term for mother. Moaning Minnie or Minny is an abbreviation of German 'minenwerfer', a trench mortar, or bomb discharged by it. And from the Glamorgan Police at War archives; "...air raid duties were a crucial part of police duty. The police were responsible for sounding the air raid siren, known as a “moaning minny” because of its distinctive whining sound, to warn of impending attack. Any police not on duty would report for duty immediately, ensuring that the Blackout was being implemented, evacuating dangerous areas and guiding the general public towards their nearest air raid shelter. 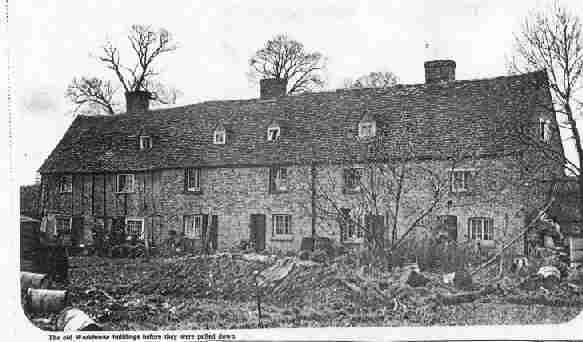 Minney Row, a row of cottages built in 1663 in Great Barford, Bedfordshire and demolished in 1966.The official name was Willoughby Cottages. Minneys occupied these six cottages from around 1900 on. At one stage between the world wars, all six were occupied by Minneys. No.5 and No.6 = Mr and Mrs Ben Minney. 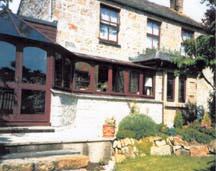 In Penzance, Cornwall there is a Bed and Breakfast accommodation called The Minney. It is believed that the name is a corruption of Mennaye, the part of Penzance where the house is situated. The Royal Cornwall Museum said that Mennaye is derived from either the Cornish word Maen meaning stone or more likely Menehay meaning sanctuary. The owner of The Minney is a Jill Hamer and can be contacted on j.hamer@zoom.co.uk should anyone wish to book a stay at The Minney, 31 Alexandra Gardens, Penzance. Click on thumbnail picture to view full size photo of The Minney. Georgina, known as Minney Seymour (1798 - 1848) is sometimes alleged to be the daughter of George, Prince of Wales and Mrs Maria Fitzherbert. Minney is found in an Hebrew Bible dictionary. The word is a preposition; from, out of, on account since, etc. According to a Chicago University Web site, the name Minney occurs in Iceland. The list of names was compiled from various lists of Icelandic students and faculty, but all are used by real Icelandic people. Only first and middle names were extracted. Minney appears on the female list. Minny Pops was a four piece pop group from Holland in the late 1970s and early 1980s. Southern Minny Stars also known as Minny Stars also known as Austin Minny Stars, is the name of USA baseball team that plays in the Northwoods League, Austin, Minnesota. The University of California has a list of oil wells. In this list under Los Angeles County Wells there is a reference to Township = '4s -9w-4', Well or lease = Minney, Well number = 1. The University thought that this indicated the Well was named after the land owner. From the Internet Movie Database are details of a 1997 film called The Maker starring Jonathan Rhys Meyers as Josh Minnell.